Japanese Episode DP 047: "Miru and Cayce and the Bottom of the Water!" American Episode 1047: "Sandshrew's Locker!" Satoshi and his friends figure out that they're only a few days' walk from Yosuga City and become excited at the prospect of finally arriving in the city. Luckily for them, they encounter a young trainer named Miru who offers to have her Cayce use Teleport to send them straight to Yosuga City. Our heroes accept, but Cayce teleports them to a dam instead! She apologizes for the detour and asks if they could help her retrieve a submerged pendant in the meantime. Satoshi and his friends reluctantly accept and follow her into the water. As they swim, Takeshi's becomes suspicious of the fact that Miru seems to know exactly what she's doing. Before long, the gang is attacked by a Gyarados, forcing everyone to retreat to the shore. Once above water, Takeshi confronts Miru, saying that she should have warned them about the Gyarados that he's sure she was aware of. Miru finally comes clean and reveals that the real treasure that had sunk into the bottom of the lake is a Monster Ball with a Sand that she and her friends had been raising. She confesses that she did know a lot more than she had been putting on, but was afraid that if she had told them the truth, they wouldn't have helped her. Satoshi and his friends forgive Miru and work out a plan to lead the Gyarados above water so that it can be defeated with Pikachu's electric attacks without anyone else getting shocked. Now that the water pokemon is out of the way, Miru is free to retrieve the lost Monster Ball. Before she can return to the surface, however, the Rocket-Dan appear and attempt to capture Miru's Cayce! The psychic pokemon is able to teleport away to safety, prompting the Rocket-Dan to make a second capture attempt, but they are quickly foiled by Miru's newly-rescued pokemon. Now that Miru has retrieved her pokemon, she has Cayce transport everyone to Yosuga City! Will Satoshi and Hikari be able to succeed in their upcoming matches? I have mixed feelings about this episode. I really liked Miru and how she's a tricky little b-word - a rarity in a series where everyone seems to be a goody two-shoes - and how she manages to repeatedly trick our heroes. I also liked how this episode featured some old Kanto pokemon that never really got much of a proper spotlight even if Miru's Cayce really should have been a Yungeller instead. At the same time, the whole dam thing doesn't really make a lot of sense to me. If you have advance notice that your town is going to be flooded for some dam, wouldn't you make sure to go to the school where your pokemon is hidden and ...y'know...take it before the flooding? I'm also not happy with the anime deciding to use Gyarados again...it's practically become the Spear of the water, hasn't it? Some theorize that this episode is about China's Three Gorges Dam project, but since absolutely zero commentary is made in this episode about the actual flooding or how it displaced so many people, it doesn't seem too likely. My copy of the English version of this episode isn't from the Cartoon Network airing - it's from the Network Ten Australia airing - and contains a number of substantial cuts. The first two Team Rocket scenes are removed entirely, and a lot of the scenes of everyone searching underwater the first time they jump into the lake are excised as well. When all is said and done, about a minute and a half worth of footage is removed. These scenes were retained in the American airing and in the Spanish dub, so it looks like this is an Australian-only edit. Weird. Other than that...does anyone have any idea why NoA would change Miru's name to Mira? Is changing one little vowel actually necessary? 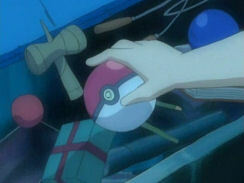 One of the little things that we see float out of the episode's titular locker is a kendama, an old-timey Japanese toy that's basically the Japanese equivalent of a ball and cup attached by a string. There also appears to be a...wrapped present in there? Guess someone wasted their money on a present that they didn't give, huh? Later, during the Rocket-Dan's motto, en echo effect is heard in the Japanese version that isn't carried over for the dub. During the final battle of the episode, Mezase Pokemon Master '98 can be heard playing in the background. This is, of course, removed from the dub.